The meeting will cover topics related to the final stages of stellar evolution and the many important aspects of astronomy that depend on understanding how stars die and what happens to their remnants. Topics related to the stars themselves and how their later stages of evolution proceed, as well as how their demise affects their immediate surroundings and host galaxies, will be addressed. The meeting will be unique in bringing together researchers in quite diverse areas of stellar astrophysics, but which actually have strong connections. Channels of stellar death: The dichotomy between low-mass and high mass stars in their evolution and death as been established since many decades and constitutes the basis of many textbooks: low and intermediate mass stars produce a degenerate C/O core which, after a short but intriguing phase known as planetary nebula, becomes the final white dwarf; massive stars, on the other hand, will spent a much shorter but more eventful life that culminates in a final explosion, known as a supernova. Things have become more blurred in the recent years, however. It is now clear that there is a huge deficiency in the number of planetary nebulae (PNe) in the Galaxy, if indeed all low and intermediate mass stars go through this evolutionary stage. Moreover, in order to explain the 80% of aspherical PNe, it is now becoming more and more obvious that binarity is a key factor. Perhaps even to the extent that PNe won’t be produced by single stars at all! On the front of supernovae also, things have become more complicated. For example, in recent years a growing number of under-energetic and unusual supernovae (SNe) have been discovered. The faint transients SN2008S and SN2008ha represent two of these peculiar events, whose nature is still ambiguous and extensively debated, being either SN “impostors” or electron-capture SNe involving a super-AGB star. Strangely enough, recent observations have also shown that what was thought to be well known – the upper limit of the masses of stars – appeared incorrect: there are now evidence for stars whose initial mass was twice as large as the previous limit. In the last three years there has been an increasing interest in the importance of binarity for the evolution of massive stars. A striking result is the very large proportion of binaries among massive stars – up to 90%! – and the strong preference for binaries with short orbital periods of several days and less. Products of stellar death: Mass loss from evolved stars, both high and low mass, profoundly affects their host galaxies, leaving imprints that can be detected throughout the age of the universe. Theories and observations of the chemical evolution of galaxies both rely on and inform theories of stellar evolution. Quasars at redshifts of >6 are observed to contain hundreds of millions of solar masses of dust, only a few hundred million years after the Big Bang. The known sources of dust cannot account for this enormous quantity. Meanwhile in the local universe, studies have found that the combined contributions of high mass and low mass stars to the dust budget of galaxies fall short of the observed totals. Where is the dust in the universe coming from? Low mass stars are the dominant source of nitrogen in the universe, while high mass stars are the main source of oxygen, but the question of which type of stars produce the universe’s carbon is still unresolved. Stellar death in an extragalactic context: Finally dying stars provide tools with which to examine the evolution of the universe, with the Type Ia supernovae being the most prominent example, used to reveal the acceleration of the universe’s expansion. Despite their fundamental importance, the progenitors of Type Ia supernovae have not been unambiguously identified, and nor has the relative importance of single and double degenerate channels been quantified. Recent years have seen great advances in studies of recurrent novae, as their outbursts have been predicted in advance and consequently observed in great detail. However, controversy still exists as to whether each eruption ultimately increases or reduces the mass of the white dwarf for any of the handful of known recurrent novae. 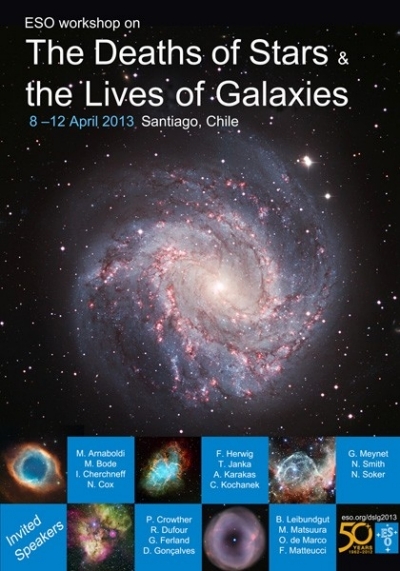 Nova-like events observed inside planetary nebulae also suggest that in some cases, these objects could be potential supernovae progenitors, a finding which illustrates the potential benefits of bringing together researchers from fields as nominally distinct as novae, planetary nebulae and cosmology. All these developments clearly illustrate the timeliness of a review of these topics, and more importantly, of the need to link them together, so as to gain new insights from this wide, rather than traditional, approach.